The only one-stop reference to design, analysis, and manufacturing concepts for power devices utilizing HTS. High temperature superconductors (HTS) have been used for building many devices for electric grids worldwide and for large ship propulsion motors for the U.S. Navy. And yet, there has been no single source discussing theory and design issues relating to power applications of HTS—until now. 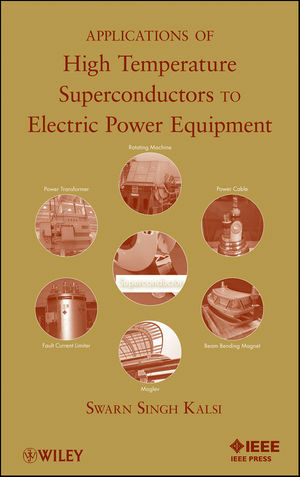 This book provides design and analysis for various devices and includes examples of devices built over the last decade. Starting with a complete overview of HTS, the subsequent chapters are dedicated to specific devices: cooling and thermal insulation systems; rotating AC and DC machines; transformers; fault current limiters; power cables; and Maglev transport. As applicable, each chapter provides a history of the device, principles, configuration, design and design challenges, prototypes, and manufacturing issues, with each ending with a summary of the material covered. The design analysis and design examples provide critical insight for readers to successfully design their own devices. Original equipment manufacturer (OEM) designers, industry and utilities users, universities and defense services research groups, and senior/postgraduate engineering students and instructors will rely on this resource. "HTS technology reduces electric losses and increases the efficiency of power equipment. This book by Swarn Kalsi, a leading expert on the HTS subject, provides a survey of the HTS technology and the design rules, performance analyses, and manufacturing concepts for power application-related devices. It compares conventional and HTS technology approaches for device design and provides significant examples of devices utilizing the HTS technology today. The book is useful for a broad spectrum of professionals worldwide: students, teaching staff, and OEM designers as well as users in industry and electric utilities." SWARN SINGH KALSI, PhD, has more than forty years of directly related experience (while working for General Electric, Northrop Grumman, and American Superconductor) in all aspects of superconducting magnet technology and electrical engineering. The holder of more than thirty U.S. patents, Dr. Kalsi's entire background has been in the area of electrical power equipment and power systems. During his long career, he has designed and built superconducting devices in areas such as motors and generators, power transmission cables, transformers, fault current limiters, fusion reactors, Maglev, and synchrotrons. Dr. Kalsi also has an extensive background in design and fabrication of conventional motors, generators, control systems, and switchgears. He has served on several IEEE and Cigre panels for work relating to conventional and superconductor technologies. 2.2 HTS Background and Nomenclature. 2.4.2 Characteristics - Electrical and Mechanical. 2.7 State-of-the-art of Various HTS Conductors. CHAPTER 3 Cooling and Thermal Insulation Systems. 3.2 Anatomy of a Cryostat. 3.3 Cryogenic Fluids for Cooling HTS Magnets. 3.4 Direct Cooling with Cryogens. 3.5 Indirect or Conduction Cooling. 3.7 Open Loop Cooling with Liquid Nitrogen. 3.9.1 Design of Conduction Cooled Leads. 3.10.2.1 Radiation Thermal Load Through MLI. CHAPTER 4 Rotating AC Machines. 4.3 Analysis and Parameter Calculations. 4.3.1 Magnetic Circuit and Harmonic Components. 4.4.1 Stator Winding Design Issues. 4.4.2 Field Winding Design Issues. 4.4.3 Electromagnetic (EM) Shield Design Issues. 4.4.4 Loss and Efficiency Calculations. 4.5.1 Superconducting Field Winding and Its Cooling Systems. 4.5.2 Torque Transfer from Col Field Winding to Warm Shaft. CHAPTER 5 Rotating DC Homoploar Machines. CHAPTER 6 Synchronous AC Homoploar Machines. CHAPTER 8 Fault Current Limiters. 8.2.1 Resistive Fault Current Limiters (R-FCL). 8.2.2 Inductive FCL with Shielded Iron Core. 8.2.3 Inductive FCL with Saturated Iron Core. 8.3.1 Example Design - Resistive FCL. 8.3.2 Example Design - Saturated Core FCL. 8.4.1 Challenges of Resistive FCL. 8.4.2 Challenges of Inductive FCL. 8.6.1 AMSC’s Fault Current Limiter. 8.6.2 Superpower’s Fault Current Limiter. 8.6.3 Zenergy Power’s Fault Current Limiter. 8.6.4 Nexans’s Fault Current Limiter. 9.3.2.1 HTS Coaxial Cable - High Voltage. 9.3.2.2 HTS Coaxial Cable - Medium Voltage. 9.3.2.3 TriaxTM HTS Cable - Medium Voltage. 9.6.2 HTS Cable - High Voltage. 9.6.3 HTS Cable - Medium Voltage. 9.6.4 TriaxTM HTS Cable - Medium Voltage. 10.2.2 Electro-magnetic Suspension (EMS) . CHAPTER 11 Other Applications of HTS.